Most people don’t put insurance on their hurricane preparedness checklist. But they should! Having the right amount and type of insurance is a crucial component of disaster preparedness. And the good news is that it only takes one simple step – a call to your insurance professional. Making sure you understand all your insurance options and updating insurance coverage should be as routine as an annual physical. Think of it as a way to maintain a healthy financial future if a natural disaster were to strike. Prior to a conversation with your insurance professional, take a few minutes to write down all of your insurance questions. Or even better, pull out and read your current insurance policy. This is bound to lead you to more questions, and that’s a good thing. An important partner in hurricane preparedness is an insurance agent or company representative who is willing to answer all of your questions and clearly explain what is covered and what is not. If he or she can’t answer questions to your satisfaction, find another insurance professional. Insurance is a very competitive business, and there are many insurers who would like to deliver top-notch service to you and your family. Know which disasters are covered in a homeowners policy and which are not. Wind damage is covered, no matter if the cause is a tornado, catastrophic hurricane or just a summer storm. When a wind blows, it is going to be covered by standard home and business insurance policies. Keep in mind that in most coastal states there is both a standard deductible and a hurricane deductible. The former is a flat dollar amount, such as $1,000, while the latter is typically a percentage of the insured value of your home. The one big hurricane-related disaster that is not covered by standard policies is flooding. Fortunately, flood insurance is available from the National Flood Insurance Program (NFIP) and from a few private insurance companies. Did you know that 90 percent of all natural disasters involve some form of flooding? That is reason enough for everyone to consider flood insurance. And don’t be lulled into the false notion that only areas bordering large bodies of water get flooded. Floods can occur wherever it rains, and at least 20 percent of flood claims are paid to people who live in low- to moderate-risk flood zones. In general, the lower your flood risk, the less you pay for protection. 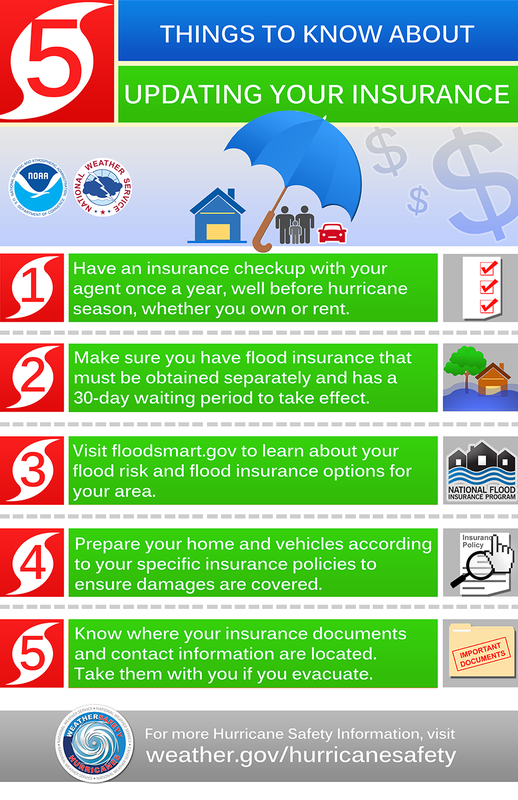 Learn more about your risk of flooding and the estimated cost of an NFIP flood insurance policy by going to www.floodsmart.gov. I always remind people that in addition to the right kind of coverage, they also need the right amount of insurance. What that means is having enough insurance to completely rebuild your home and replace all its contents. Rebuilding costs are often a lot higher than a home’s real estate or market value, because the costs of building materials and labor continue to rise. Be smart. Be ready. Ask questions. Give yourself confidence that your insurance is up to date and ready to protect your financial future – before hurricane season starts. For more information on insurance, visit the Insurance Information Institute’s website at www.iii.org. This entry was posted in NHC, Outreach, Preparedness and tagged #HurricanePrep, #HurricaneStrong, #ItOnlyTakesOne, insurance, NFIP.